What kind of a show vehicle can be built on a student's budget? Take a look at the pictures around this article and you can see. 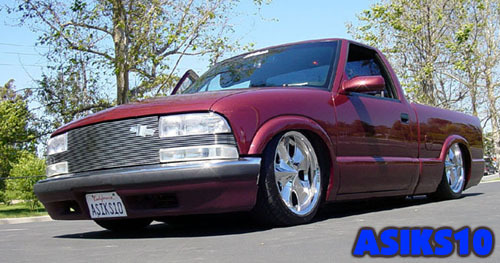 That's right, Joe Joffino built this truck on a college student's budget. Just imagine what he'll do once he graduates and becomes a CHP. Joe brought his truck closer to the ground by installing Firestone Air Bags all around and a set of de-arched mono leaf-springs in the rear. 2 Thomas 317 air compressors and 2 five gallon air tanks mounted under the bed supply the air flow through the SMC valves to lift and lower Joe's ride. A 6 switch control allows Joe to hit front, back, and side to side through his 1/2 inch air system. To finish off the suspension Joe bolted on a set of chrome 18" Mondera wheels. At the rear of the truck Joe shaved the tailgate handle and re-installed it back on the inside. A Sir Michaels rollpan with a frenched in license plate was then molded to the bottom of bed. To finish off the bed Joe had a custom Iron Cross design and message welded onto the notch cover and then had the bed sprayed with a Line-X coating.